We collect and store information that you enter into this Web site. When you open an account or place an order, we collect and store some or all of the following information that you provide: name, billing address, shipping address, email address, telephone number, credit card number and expiration date. We use your personal information that we collect to conduct our business and to provide you with the best possible products and services. To best serve you, we may share your personal information with other members of the Shopandersonseafoods.com team and with third party service providers that provide support services to us or that help us market our products and services. 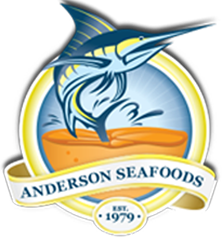 Third parties who perform services on our behalf, are contractually restricted from using your information in any manner other than in helping us to provide you with the products and services available from Shopandersonseafoods.com. By storing personal information with Shopandersonseafoods.com, you have elected to use the storage to improve the shopping experience and will indemnify defend and hold Shopandersonseafoods.com harmless from any theft or abuse of such stored informaiton that was not due to the negligence of Shopandersonseafoods.com. Shopandersonseafoods.com does not direct any of our content specifically to children. Users of our Site are required to be at least 18 years old, and any user under 18 is not an authorized user. If we learn that a user is under thirteen (13) years of age, we will promptly delete any Personal Information we have collected about that user. Shopandersonseafoods.com may share information carefully to selected vendors and business partners with whom we work with. This includes companies that offer affinity, frequent-user, and reward programs; and, companies that perform marketing services and other business operations for us (including providing goods and services to our users, as necessary to complete transactions of your request). All companies that act on our behalf are contractually obligated to keep all information confidential and to use the customer information only to provide the services we ask them to perform for you and us. We may share non-personal information with our marketing partners, advertisers, and others from time to time. Examples of such non-personal information include the number of users who visited this Web site during a specific time period or purchased a specific product through this Web site. This information generally is shared in an aggregated form. We may release personal information if we believe in good faith that: the law or legal process requires it; we have received a valid administrative request from a law enforcement agency; or such release is necessary to protect the rights, property or safety of Shopandersonseafoods.com, or any of our respective affiliates, business partners, customers or others. We use various security measures, including Secure Socket Layer (SSL) encryption technology, to protect personal information that we collect. If you place an order through this Web site, you will be asked to set up an account and provide an email address and password. You must provide an appropriate email address and password in order to access account information. In order to help protect your personal information further, you should be careful about providing your password to others. If you wish to cancel a password, or if you become aware of any loss, theft or unauthorized use of a password, please contact: contactus@shopandersonseafoods.com. Please note that any request to be removed from such mailing lists may take up to 7 (seven) business days to become effective. Even if you are removed from any such list, if you order online, we will send you an email confirming your order and may need to contact you by phone, email, or regular mail if we have questions about your order.